The 35th annual banquet honoring this year’s inductees into the Greater Flint African American Sports Hall of Fame was held Sunday, March 24 at the Genesys Conference and Banquet Center in Grand Blanc, Michigan. Ira A. Rutherford, III served as Master of Ceremonies. The new inductees are Darryl Johnson, Todd Lyght, Deanna Nolan, Morris Peterson, MaliVai Washington, Andre Weathers, the 1978-81 Flint Northern girls’ basketball team, and the 1974 Flint Northern boys’ cross-country team. Darryl Johnson won three state championships from 1981-83 at Central High School. Johnson played for Michigan State from 1983-87. As a college junior, he averaged 16.6 points a game. In his senior year, Johnson led the team in scoring, averaging 22 points a game while being named to the Second Team All-Big Ten. Johnson was selected with the 12th overall pick in the third round of the 1987 NBA by the Golden State Warriors but actually played for the Cleveland Cavaliers 1995-96 NBA season. He played most of his professional career in the Continental Basketball Association and the World Basketball League. Todd Lyght played football at Powers Catholic where he was a star wide receiver and defensive back. He also served as team captain and ran track for three years. Lyght played college football at Norte Dame and was a two-time All American in 1989 and 90. Lyght was also a finalist for the Jim Thorpe Award and was the first round, fifth overall pick, of the St. Louis Rams in the 1991 draft. In 1999, Lyght earned his first Pro Bowl selection and was a First-team All-Pro. He helped the Rams win the 2000 Super Bowl. Deanna Nolan led the Flint Northern girls’ basketball team in back-to-back state championships in 1994-95. She was named Michigan’s Miss Basketball in 1995. Nolan played college basketball at the University of Georgia, and in 2001 she earned All-SEC Tournament Team honors in her senior year. In the 2001 WNBA draft, Nolan was selected by the Detroit Shock in the first round, (sixth overall). Nolan helped the Shock win three championships. She was named WNBA Finals MVP in 2006 and was also named to the WNBA All-Star Team. Peterson was drafted by the Toronto Raptors in the first round and was named to the NBA’s All-Rookie First Team in 2000-01. He played eleven seasons in the NBA for Toronto, New Orleans, and Oklahoma City. MaliVai eventually won four ATP titles and reached the 1996 men’s singles finals at Wimbledon. In 1994 he created the MaliVai Washington Foundation based in Jacksonville, FL and in 2009, he was awarded the ATP Arthur Ashe Humanitarian of the Year Award for his positive work with young people promoting academic achievement and positive life skills. Weathers was selected by the New York Giants in the sixth round of the 1999 NFL draft, but his career was cut short due to knee injuries. After retiring from football, Weathers worked as a football coach at Central and Bentley High Schools. He is currently the head coach at Flint High School. The Flint Northern girls’ basketball team, led by Coach Dorthy Kukulka, won four straight Class A titles in 1978-81. This dynasty ran for so long that the GFAAS Hall of Fame committee had to expand its parameters this year. The Lady Vikings of those years represent the first time four teams have been combined as a single entry into the Hall of Fame. Northern posted records of 23-0 in 1978, 25-0 in ‘79, 26-0 in ‘80 and 20-6 in ‘81. During that incredible run, the Lady Vikings won 76 consecutive games. Some of the key players on those record-setting rosters included Pam and Paula McGee, Letitia Hughley, Judy Tucker, Lawanna Hughley, Teresa Anthony, Delois Wilson, Kimberly Tartt, Felicia Cooper, Venita Bowie, and many others. 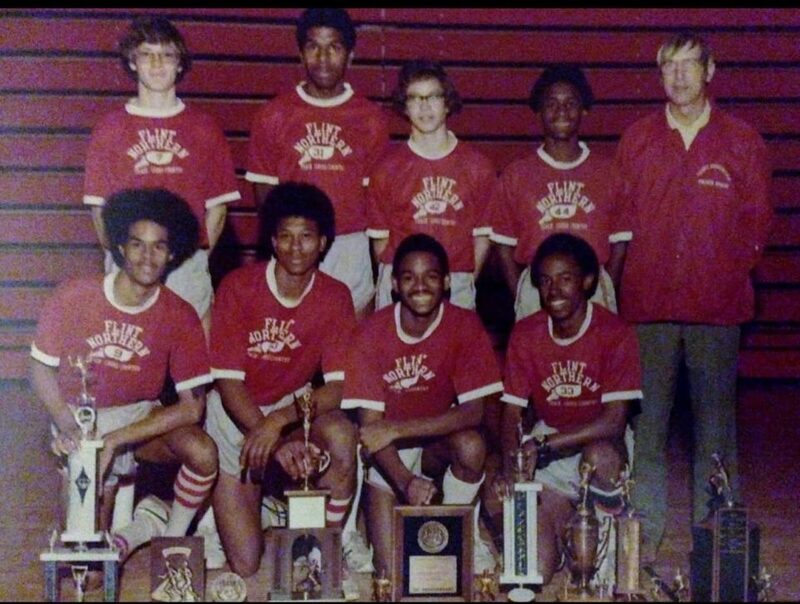 In 1974, the Flint Northern boys’ cross-country team won the City, Valley, Regional and Class A State Championships as well as the Tri-State (Ohio, Indiana, and Michigan) Invitational Championship. Team members were Keith Young, Steve Branch, Michael Bowen, Bruce Towar, Anthony Sullivan, John Hanford, Ronald Whitner, and Richard MacInnes. Legendary Norbert Badar served as the coach for 33 years. The goal of the GFAAS Hall of Fame is to preserve and exhibit the history of former Flint African Americans athletes. Founder, Norm Bryant wants to fulfill that goal by establishing kiosks throughout the city that will provide information about the HOF, its inductees, and their accomplishments. Today, there is one kiosk located in the lobby of the Flint Public Library. “I want to encourage all current and past inductees, as well as others –including fans, business owners or any organizations to donate to the cause,” Bryant continued. You can donate $1,000-gold status, $500-silver status or $250-bronze status. For more information or to donate, you may contact Norm Bryant @ 810-221-5948.